The 1400 Series E-Brake Lightweight, which fits a variety of weapon systems, SIGNIFICANTLY reduces both recoil and muzzle rise so that the weapon falls directly back on target aiding in faster follow-on shots. 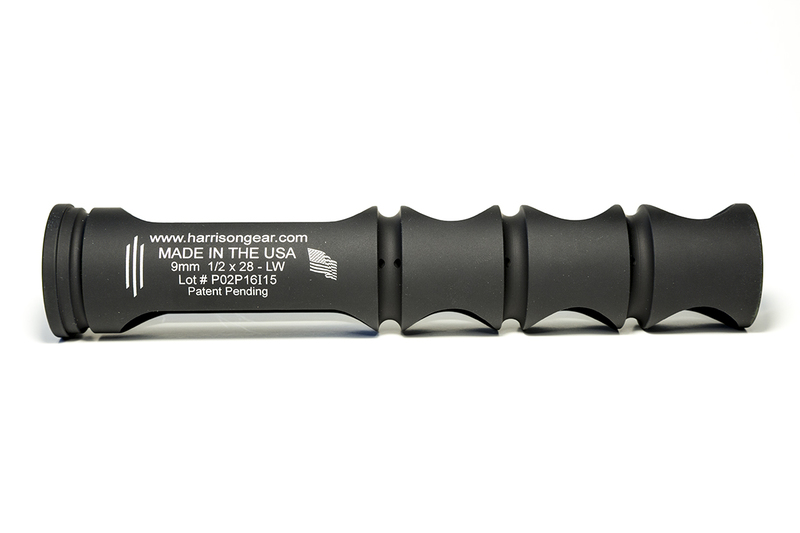 Precision machined from Mil Certified American made 7075 T6 Aluminum bar stock, coupled with exceptional threading for superb barrel mating. The 1400 Series E-Brake Lightweight has a black hard anodized coating that provides a rugged and durable finish. Additionally the anodizing process gives significant strength to the aluminum. The E-Brake Lightweight is a featherweight and performs exceptionally well. 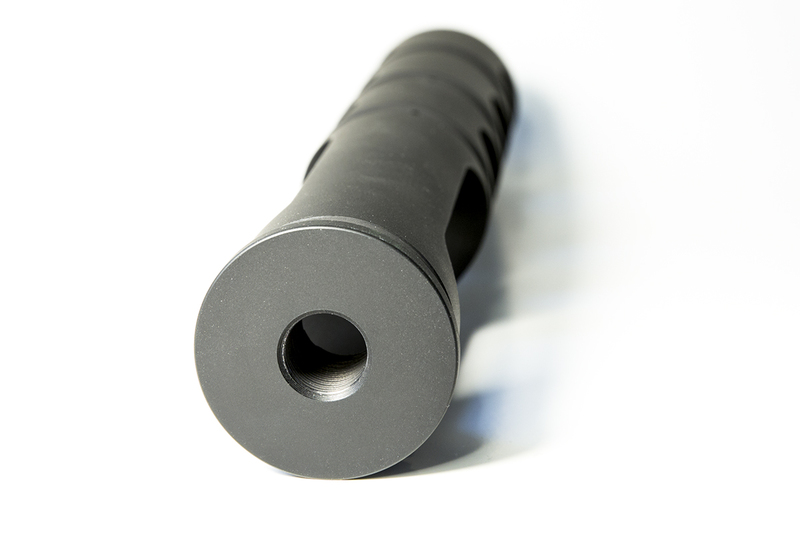 This is intended for 300 Blk, .22's or any subsonic loads you may have dialed in. It will perform just as well with full power loads but a reduced service life. The 1400 Series E-Brake Lightweight has multiple gas port holes at approximately the 9 and 3 o’clock position to counter muzzle rise and aid in follow-on shot accuracy. Each 1400 Series E-Brake Lightweight is covered by Harrison Gear's limited lifetime warranty against manufacturing or material defects. The 1400 Series E-Brake Lightweight is 100% American made, from American materials. 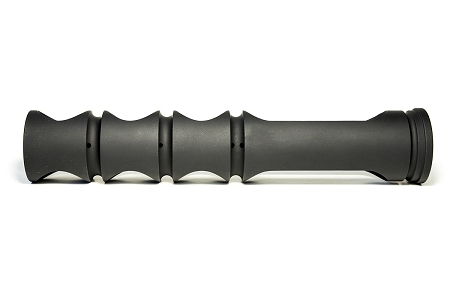 NOTE: The 1400 Series E-Brake Lightweight may be permanently mounted to bring 8.5" barrels to legal length. For further information regarding such installation please contact a current and competent gunsmith or the BATFE. •Extremely lightweight coming in around 7.2 ounces! •Do not install crush type washers in conjunction with the 1400 Series E-Brake. Please use the included GemTech Precision Shim kits to properly time and mount the brake. 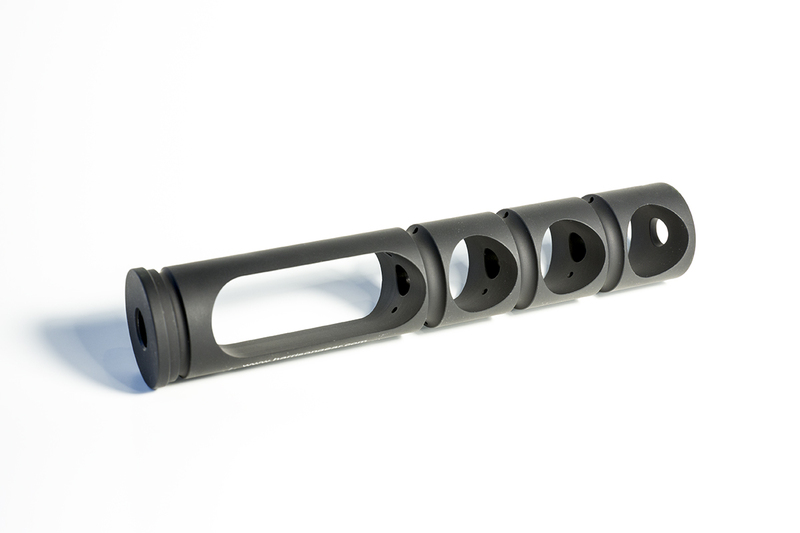 Outer diameter 1.4" overall length 7.675"
Newly added 13.5x1 LH E-Brake for the Sig Sauer MPX Weapon system! This is the perfect thing for a .300 black out. Its super light and looks great. I will be buying another one after someone broke into my house and stole my entire rifle. It was great though while I had it, reduced recoil a TON! Works really good on a 10/22 and so light I don't notice on the end of my tactical solutions barrel. Q: What is the weight diffence between the 1400 and the 1400 LW? One says it is made with steel the other says it is made with aluminum. The lightweight version is a hair over 7 oz and the standard 1400 series is 24 oz approximately. Keep in mind we are not measuring on a precision scale but it's fairly accurate. Q: Will this brake fit on the VDI glock 17 upper threaded barrel?